A bloody campaign to the ends of the earth, fierce battles against the armies of the Cross, a thirteen-moon siege of a great city, and an undying dream to return to the Forest. Book III is the turning-point of Da-Ren’s story as the Tribe invades the seven cities of the South. Myths unravel and legends drown in the blood of the innocent. Da-Ren learns of new gods, none as powerful as gold. He pays for victories with nightmares, for wisdom with loss. Empires crumble and cities are reduced to ruins, but there is no glorious story to guide him to the stars. Only a faint hope that metamorphosis awaits at the end of the journey. 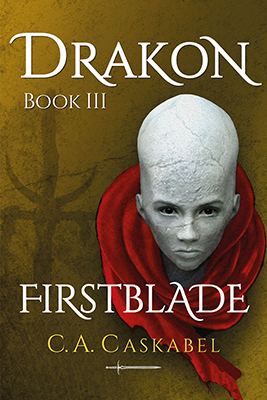 Firstblade is a book of poisons: the legends of hatred, the words of the witches, the scorpion’s sting and the Drakon’s blood, the hunger of a mad leader for power. Love. One poison will prove stronger than all others.